In Object Oriented Programming (OOP), the Decorator Pattern is a Design Pattern that allows a client to instantiate a class and then wrap that object with one or more other classes for the purpose of extending the behavior of the original class. Keep in mind that a “class” is simply a text file that contains code. However, a class becomes an object when the class is instantiated. With that in mind, consider the fact that once a class is designed and written (and saved to a text file), a client that instantiates that class (to make an object of that class) has no way of changing the inner workings of that class. The Decorator Pattern is a design construct that allows a client to extend the behavior of the class without having to make changes to the guts of class. Here’s a design example of how the Decorator Pattern may be implemented in C# .NET. 47 /// All generic controllers have a Controller ID. 52 /// All generic controllers have a Name. 62 /// All generic controllers have a method that will execute core controller tasks. 63 /// Any Decorators that need to Run() will be fired by the concrete decorator class. 124 /// This is the abstract Controller Application class (the abstract Decorator). 137 /// All generic applications will override the generic controller run method. 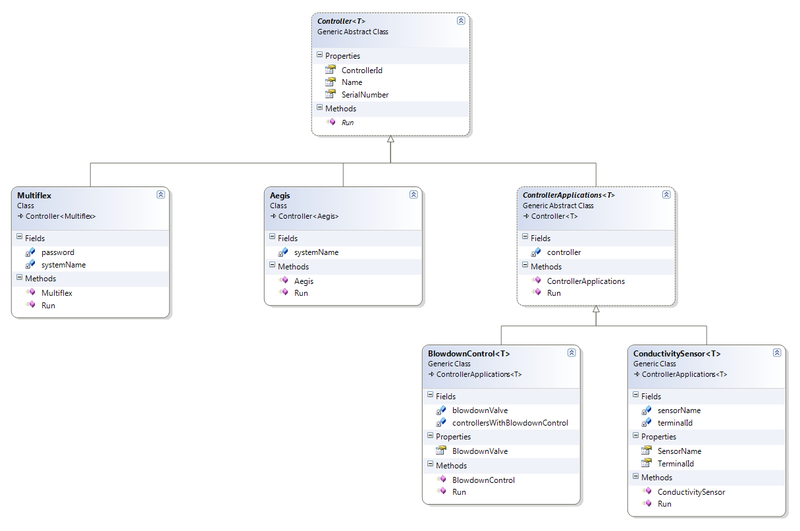 controller applications to each of the controller objects. Sensor Name: Tower 1 Cond. An important design implementation that is worth considering is how the Concrete Decorators (BlowdownControl and ConductivitySensor) HAS-A Controller object and IS-A Controller type. The fact that the decorators HAS-A controller object means that they can manipulate the controller state and the fact that the decorator IS-A Controller type means that they can extend the behavior of the Controller class. If you are using the .NET Framework, there is no need to ever implement the Observer Pattern. Instead, you will want to use Delegates and Events.